The Syrian Kurdish People's Protection Units (YPG) will participate in the formation of the new government on condition they agree to lay down arms and support Syrian territorial integrity, Turkish Foreign Minister Mevlut Cavusoglu said Friday. 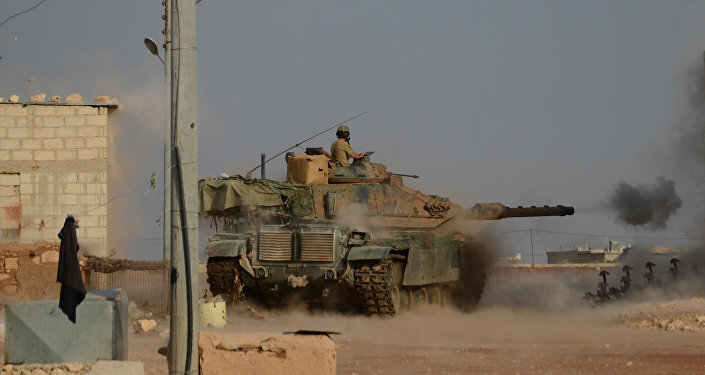 ANKARA (Sputnik) — Ankara considers the PYD and its armed wing, the YPG, to be affiliated with the Kurdistan Worker's Party (PKK), which has been designated a terrorist group by Turkey as well as the United States. "The Syria's Kurdish Democratic Union Party (PYD) will not take part in the talks on Syrian settlement in Astana. As for its armed wing, the YPG, if they lay down arms and support the territorial integrity of Syria instead of forming a terrorist canton, they will be included in the country's government. If they do not refuse terrorism… we will continue our struggle against them," Cavusoglu told reporters. On Thursday, Russian President Vladimir Putin announced that the Syrian government and armed opposition groups reached an agreement on a ceasefire on Syrian territory, taking effect at 00:00 on Friday. Russia and Turkey took the role of the ceasefire guarantors, but other countries may also be invited, according to Russian Foreign Minister Sergey Lavrov. The Syrian Kurds have been fighting against the Daesh militant group for years and has been controlling several areas of Syria, including Manbij. On August 24, the Turkish army with the support of US-led coalition aircraft launched the Euphrates Shield operation to clear Jarablus and the surrounding area of Daesh, outlawed in Russia and many other countries. The operation has been widely criticized both by the Syrian Kurds and Damascus accusing Ankara of violating Syria's territorial integrity.